Bob Dylan mania is upon us like so much hard wind blowing off an hot and angry sea, and the scrutiny, in the form of documentaries and a wave of yet more books on the songwriter , focuses almost exclusively on six years in the Sixties. Critic David Greenberg wrote a fine essay in 2005 why Dylan's later work, much of it as brilliant as anything he created earlier, is mostly ignored by cultural historians who want to make a case for greatness. Read it here at Slate. History is not just written by the victor, but also by those who live the longest, and in that sense it's small wonder that Dylan's dynamic six years in the Sixties, spanning the albums Another Side of Bob Dylan through John Wesley Harding are the ones that are poured over again and again. 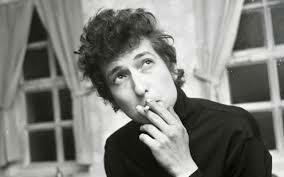 For otherwise bright and brilliant literary commentators and keen minds like Todd Gitlin and especially Greil Marcus, Dylan's career is ceases to be about the way he fused separate musical traditions or broadened the scope of how song lyrics could address experience and more about the good old days when things were smoking. Marcus, who above all others is the most chronic of the prolix Dylan obsessionists, has adapted Dylan's poetic tricks of not saying what he means, offering allusion, metaphor and other bridges to nowhere as he discusses the work. Rather, he discusses everything that is around the work, seemingly to create historical context and situate the words of "Desolation Row" or "Like a Rolling Stone" in relation to leftist politics, Hegelian zeitgeist, and counter cultural virtues, but that is abandoned quickly enough as Marcus's endless stream of essays become, suddenly, the equivalent of a forced tour of the old neighborhood. As well as he writes and as keen as he can sometimes be as an commentator, there's something like Granpa Simpson in how Marcus talks about Dylan; there is a propensity for anecdote, political aphorism, mentions of high and mass culture icons, a cursory reference to seminal past avant gard movements, and then....vapor!, nothing at all, a sudden halt or a radical change in direction. Marcus perhaps wants to lead the pack in this industry of Sixty-something Dylan critics by molding his remarks in the cryptic diffusion that has always characterized Dylan's lyrics and is hopeful, perhaps, that yet another generation of furious scribblers will fill their hard drives with essays trying to parse what it was Greil Marcus was trying to get across about Dylan's deep-imagery before he was distracted. It's an intriguing idea that so much of the commentary rising from the bright , the brilliant and acerbic, in the guise of Marcus, Christopher Ricks , Gitlin and endless others, become fuzzy, drifting and vague at the center of their commentaries when Dylan and his art are the subject.It might be that to say what you think, or at least make what you mean clear, would blow their game altogether. 2. Laser-focused product messaging keyed to the lifestyle of the target is critical . 3. Each consumer group and site will tolerate limited repetition of messaging. 4. Appreciate the hierarchy through which each group travels as their social networking skills and experience increase and improve. 5. Stagger hierarchy messaging to achieve the most effective names against Dad. 6. Do NOT touch another man’s drink.